Congratulations to Nikola Curanovic, winner of the $300 Deep Stack Event at the 2012 Foxwoods Poker Classic. Curanovic takes home the 1st place prize of $11,624 plus the Foxwoods Poker Classic Trophy and watch! Kulenych has Curanovic dominated and is looking good to double up until the board comes [As][Jd][3c][Ks][9s]. Curanovic catches runner-runner club to make a flush and win the pot. Kulenych is eliminated in 2nd place and takes home $9,000. The board comes [Ks][7s][2h][3h][Tc] and Curanovic spikes a ten on the river to win the pot. 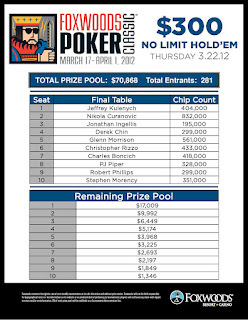 Piper is eliminated in 3rd place for $9,000. On a board reading [As][6d][4d][Qs], Christopher Rizzo gets all-in with [Qd][7d] against the [Ac][Qh] of Nikola Curanovic. The [9c] falls on the river and Curanovic wins the pot, eliminating Rizzo in 4th place for $9,000. The final four players in the $300 Deep Stack event have decided to do a save. The players finishing in second, third and fourth will each take home $9,000 with first place taking $11,624 along with the Foxwoods Poker Classic Trophy and watch. The board runs out [Qs][Js][9d][5c][6c] and Rizzo wins the pot, eliminating Ingellis in 5th place for $3,968. 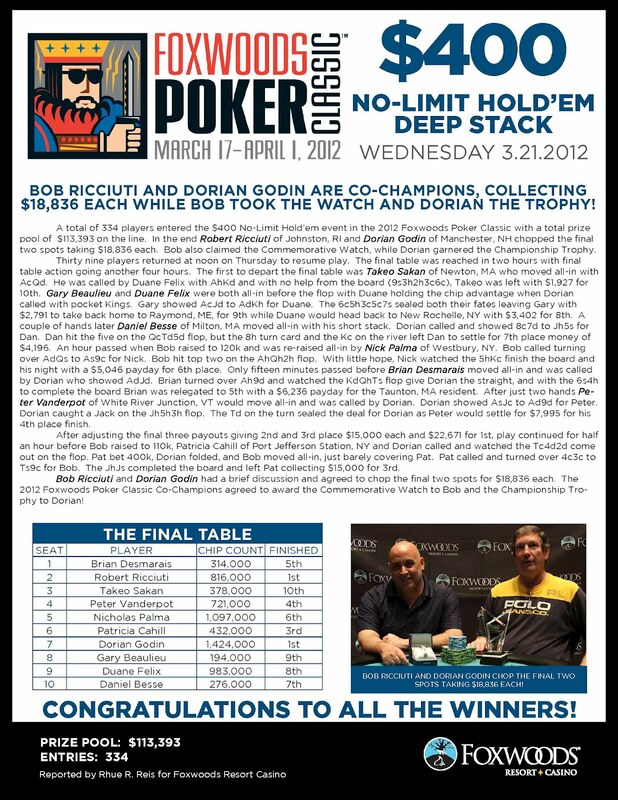 We had a total of 254 players in the $300 No-Limit Hold 'em Bounty event at the 2012 Foxwoods Poker Classic. The board runs out [Ah][9c][4h][6c][8s] and Curanovic spikes a set on the flop to take the pot. Phillips is eliminated in 6th place for $3,225. The board comes [Qh][4d][2d][6s][2s] and Curanovic improves to a full house. Morency is eliminated in 7th place at the $300 Deep Stack final table for $2,693. 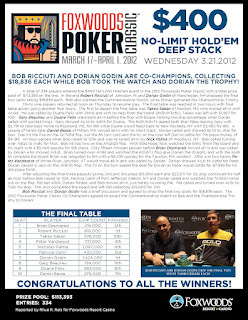 The board runs out [Qd][4s][2c][4h][Ad] and Rizzo wins the pot, eliminating Boncich in 8th place for $2,197. The board runs out [6h][5s][2c][3c][Qh] and Curanovic makes a set of deuces to win the pot, eliminating Chin in 9th place for $1,849. Glenn Morrison gets all-in before the flop with [4h][4s] against the [7c][7s] of Charles Boncich. The board runs out [Ad][6d][3c][Ks][Qd] and Boncich takes the pot. Morrison is eliminated from the $300 Deep Stack Final Table in 10th place for $1,346. The final table of the $300 Deep Stack event is set to begin.